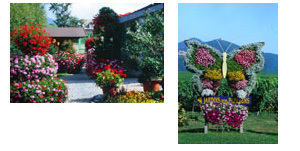 The fruit of many years of research, the Butterfly Garden is a private park that receives no grants or other financial backing but subsists solely on its revenues from entrance fees and the sale of other associated products. The park allows you to discover the secret life of these wonders of nature living naturally at the heart of the Alsatian Wine Route. We would love to welcome you to take a pleasant stroll through our luxurious floral surroundings accompanied by hundreds of exotic butterflies. To allow the butterflies to live, we have had to create a biological environment totally adapted to their needs. The butterflies living in our butterfly houses come from Africa, Asia and America. Through the season we display about 200 different species of butterfly from a number of different equatorial regions. As they live and breed under the same climatic conditions, we are able to keep the butterflies from three continents under the same roof. Butterflies are nothing like pink elephants, eagles or storks! They lead secret and hidden lives. And although discreet their fragility means that their life is a continual game of hide and seek with death. Butterfly species all over the world are threatened with rapid extinction. The main reasons lie in the destruction of the natural habitats where they reproduce; in the excessive use of pesticides and in the use of certain modern agricultural techniques. But urbanisation and its subsequent pollution can also take their share of the blame for the disappearance of butterflies. Our aim is to have a deeper understanding of the fascinating, hidden lives of butterflies and to heighten our visitors’ awareness of their usefulness in nature’s scheme. We are sure that all our visitors will appreciate the beauty of the moment as they wander through the magical universe of our butterfly houses.